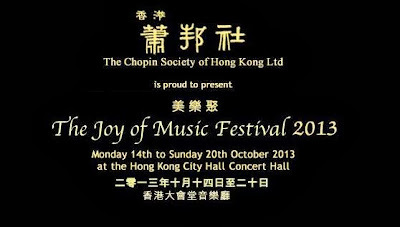 FRIENDS OF THE CHOPIN SOCIETY OF HONG KONG: DON'T MISS THE JOY OF MUSIC FESTIVAL 2013! Here are the highlights! DON'T MISS THE JOY OF MUSIC FESTIVAL 2013! Here are the highlights! promises to be another feast of great musical performances and learning experiences about music. It takes place from next Monday to Sunday (14-20 October 2013) at Hong Kong City Hall Concert Hall, with seven evenings of concerts, masterclasses and an exciting seminar on music criticism. A piano recital by LI ZHONGXIN, TSANG HIN YAT, RACHEL CHEUNG and COLLEEN LEE, all present and past students of ELEONOR WONG of the HK Academy of Performing Arts. Music by Bach, Chopin, Barber, Schumann, Bartok, Janacek, Franck and Kapustin. A piano recital by ILYA RASHKOVSKIY, 1st Prize-winner of the 2005 Hong Kong International Piano Competition, on the theme of ballet music transcribed for the piano. Music by Prokofiev, Tchaikovsky and Stravinsky. 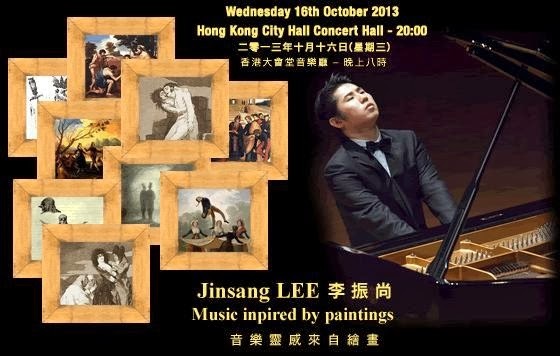 A piano recital by JINSANG LEE, 1st Prize-winner of the 2008 Hong Kong International Piano Competition, on the theme of piano music influenced by great paintings. Music by Liszt, Rachmaninov, Granados, Debussy, Mussorgsky and Korean composer Eun-Hwa Cho. Perhaps the highlight of the festival, a concert for two pianos and two cellos by GIUSEPPE ANDALORO, ILYA RASHKOVSKIY, GIOVANNI SOLLIMA and MONICA LESKOVAR, in commemoration of the 100th anniversary of the first performance of Stravinsky's ballet The Rite of Spring. Music includes stupendous transcriptions by Andaloro for this medium of Stravinsky's The Rite of Spring and Ravel's La Valse. Also music by Debussy and Lutoslawski. A cello and piano recital by GIOVANNI SOLLIMA and GIUSEPPE ANDALORO, 1st Prize-winner of the 2011 Hong Kong International Piano Competition. Music by Dowland, Beethoven Webern, Eliodoro Sollima, Giovanni Sollima and Kapustin. 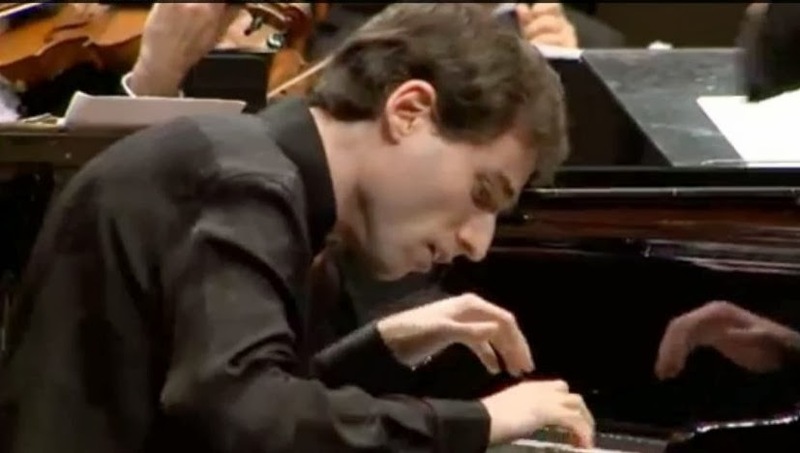 A piano recital by BORIS GILTBURG, 1st Prize-winner of the 2013 Queen Elisabeth International Piano Competition. Music by Rachmaninov, Brahms and Prokofiev. 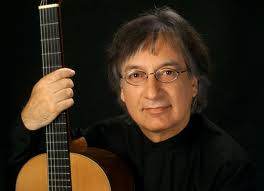 A guitar recital by ALVARO PIERRI. Music by Albeniz, Falla, Rodrigo, Granados, Barrios, Piazzolla, Lecuona, Brouwer, Ponce, Villa-Lobos and others. All concerts start at 8 pm at Hong Kong City Hall Concert Hall. 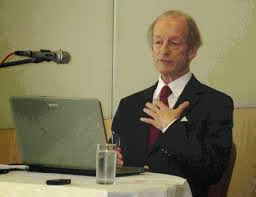 DON'T MISS the five lunchtime talks by the well-respected broadcaster and music critic JEREMY SIEPMANN on Music Criticism entitled MUSIC FROM THE OUTSIDE IN or ADVENTURES IN MUSICAL PERCEPTION.